The RLUK Associate Directors Network (ADN) is a professional network for RLUK members in a Deputy Librarian or Associate Director role. It aims to provide a forum for discussion and sharing of experience, the opportunity to participate in the business of RLUK and to aid succession planning. The ADN is open to all RLUK members that hold a Deputy Librarian or Associate Director role. Members will be nominated by the Director of their respective institution with a limit of only one ADN member per institution. The RLUK Special Collections Leadership Network (SCLN) is a professional peer network for RLUK members in a senior special collections role. It aims to provide a forum for discussion and sharing of experience, and the opportunity to participate in the business of RLUK by helping to shape the strategic direction for RLUK around special collections work. The SCLN will be aligned to the development of an audience focussed strategy for special collections, contributing to the expertise of its members as the strategy evolves through participation in discussion, workshops and events designed to drive the strategy forward. The SCLN will meet two or three times a year, and these meetings may coincide with the RLUK AGM, annual winter meeting, DCDC or the RLUK conference. It will also communicate via a JISCMail closed list for the sharing of ideas, seeking advice and support, and for the development of the SCLN programme. Open to members of an RLUK library who hold a senior special collections role. Members will be nominated (by name rather than by job title) by the Director of their respective institution with a limit of only one SCLN member per institution. To identify, share and understand the challenges, barriers and other issues involved in Open Access publishing where these relate to publisher processes and practices. To address relevant challenges as defined by Reshaping Scholarship, the RLUK Strategy 2018-21. To work collectively and with publishers to resolve problems, improve processes and achieve a better understanding on both sides of how best to support our researchers and funders. To inform, and receive direction from, the RLUK Board. To share information with each other about the issues we are facing at an operational level when working with publishers, in pursuit of both Gold and Green routes to Open Access. To develop consistent messages and approaches within the academic library community, to inform and improve interactions with publishers. To work together, and directly with publishers and funders, in order to resolve any identified issues. To maintain communications with all relevant stakeholders and to share and learn from initiatives and projects. To work closely with Jisc Collections on related work, projects, messages and priorities to ensure alignment and to avoid unnecessary duplication. To produce reports on a regular basis to the RLUK Executive team and Board. OAPP will focus on processes and practices in connection with the pursuit of Gold and Green OA. It will not deal with costs, negotiations and related issues (e.g. total cost of ownership) which are being addressed by the RLUK Ethical and Effective Publishing Group (EEPG), in partnership with Jisc Collections. RLUK institutions: members should be directly involved in an operational capacity in relevant service areas. The RLUK directorate will also be represented on the group. Other institutions: by invitation, and where there is particular relevance and value (e.g. members of relevant national projects, role in a related initiative or group, etc.). Jisc Collections: to represent relevant Jisc projects and Jisc Scholarly Communications Support. The group will meet face to face at least twice a year. Discussions and information sharing will be done electronically as much as possible. Ad hoc meetings will be arranged as required (e.g. with publishers) and will involve selected members of the group. Meeting notes and papers will be shared publicly where possible. Confidential papers will be restricted on request. 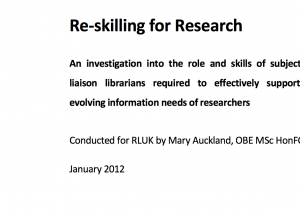 The Chair will be a senior member of an RLUK Library with a relevant operational remit. The group will communicate with each other via an RLUK Jiscmail list. The group will communicate to the Board via written report in advance of Board meetings. The group will communicate with RLUK members and other interested organisations and institutions as required in order to promote its work, to offer support and to avoid duplication. These terms of reference, the Chair, and group membership, will be reviewed biennially. International Alliance of Research Library Associations (IARLA) is a platform for collaboration amongst its members, who work together on a voluntary basis to develop agreed positions in support of an emerging international research library agenda and open scholarship. 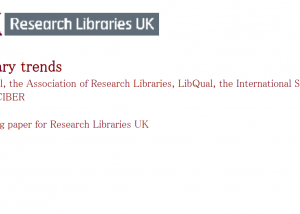 The Alliance is governed by its founding membership of five research library organisations (ARL, CARL, CAUL, LIBER, RLUK), and operates presently as an informal network without incorporated status or membership fees. The Jisc Collections Content Strategy Group (Formerly Electronic Information Resources Working Group – EIRWG) was established in 2010 to provide advice to Jisc Collections. The UUK Open Access Coordination Group works to ensure that the activities to support the transition towards open access in the UK can be effectively coordinated, have an ongoing focus and that progress can be monitored. 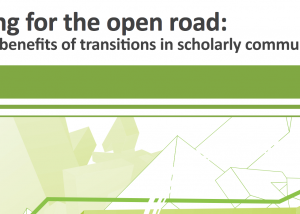 The OAI Workshops provide a space for all those interested in developments in scholarly communication to come together to learn from each other, to exchange ideas, and to hear papers from leading experts in the field. EThOS aims to demonstrate the quality of UK research by making UK doctoral theses discoverable and openly available online. It supports the UK Government’s open access principle that publications resulting from publicly-funded research should be made freely available for all researchers, providing opportunities for further research. A Jisc pilot based on a community-centred approach to lowering the cost of digital archival collections and the simple market principle: the more products purchased, the lower the price. A Jisc pilot service to allow researchers and institutions to meet their policy requirements for the deposit and curation of research data. A group formed of the merging of Jisc’s advisory groups looking after Knowledge Base+ and Bibliographic Data. The main group with oversight for the National Bibliographic Knowledge Base. Set up by HEFCE and run by UKRR, this group is made up of representatives from the British Library, Jisc, HEFCE, RLUK, SCONUL, and UKRR to investigate shared print/shared storage options. A group set up out of the work of the UUK OA Coordination Group sub-group on monographs. Their remit is to oversee an evidence-based data analysis of the current financial landscape for academic books. The Libraries and Archives Copyright Alliance (LACA) lobbies in the UK and Europe about copyright and related rights on behalf of its member organisations and UK users of copyright works through library, archive and information services. Copyright for Knowledge is a cross-sectoral body which aims to work with government at both a UK and European level to achieve a balanced copyright regime in Europe. The Digital Humanities & Digital Cultural Heritage Working Group is building a knowledge network within European libraries with an interest in digital humanities. It operates as part of LIBER’s Strategic Direction on Digital Skills & Services, which in turn is one of the key pillars of LIBER’s 2018-2022 Strategy. The Higher Education Archive Programme #HEAP is part of The National Archives’ continuing programme of engagement and sector support with particular archival constituencies. Research underpins the programme (including a series of research papers), building on a foundation of engagement and mapping work. It is a mixture of strategic and practical work encompassing activity across The National Archives and the wider sector including guidance and training, pilot projects and advocacy. This group oversees the Professional Fellowship scheme which would enhance the existing ties between TNA and RLUK members, and would be in direct support of the joint Memorandum of Understanding and supporting Action Plan, as signed in October 2014. The group has existed in many forms over a considerable number of years, having worked in a previous incarnation as the SCONUL Advisory Committee on Health Services (ACHS) which was established in 1993. The group was re-established in its current form as the Health Strategy Group in May 2004. The HSG agreed from its inception to include in its membership, those individuals who had extensive and wide-ranging experience of working with the NHS. In 2008, the HSG agreed to develop into a tripartite group of SCONUL, Research Libraries UK and CILIP to further strengthen its advocacy and engagement scope. The enlarged Joint Health Strategy Group continues to respond and to advocate at the highest levels on behalf of its constituent members. The European Alliance for Research Excellence is a coalition of companies which are committed to the future of innovation and R&D. We want modern copyright rules in Europe that enable a fair and effective use of Text and Data Mining, to ensure Europe’s competitiveness and future prosperity. An informal group looking at skill needed by library professionals working in the area of scholarly communications.